American author Charles Fleming Embree‘s A dream of a throne, the story of a Mexican revolt, published in 1900, is, I believe, the earliest novel in any language about the Lake Chapala area. It is an historical novel, set in the area during the nineteenth century, but Embree reveals an extraordinary depth of knowledge, not only of the history of this area, but also of its geography. Embree was only 24 years of age when he and his wife Virginia, newly-weds at the time, arrived in Chapala in 1898. Embree had dropped out of Wabash College in his native Indiana, without completing his degree, to devote himself to his writing and his first book, a collections of stories entitled For the Love of Tonita, and other tales of the Mesas (1897) had proved successful. The Embrees lived in Chapala for eight months in 1898, before traveling to other parts of Mexico, including Guanajauto, Xalapa, Cuernavaca and Oaxaca. Embree’s publishers described A dream of a throne as, “A powerful and highly dramatic romance, dealing with a popular Mexican uprising half a century ago. It is a novel of adventure and of war, and its strongly contrasted characters glow with life and realism. The writer’s thorough knowledge of Mexican life gives him a wealth of new material; and the descriptions of scenery at Lake Chapala are vivid, full of color, and alive with mountain air”. The book is indeed a remarkable achievement. Despite only living at Lake Chapala for a few months, Embree acquired and demonstrates, from a geographical perspective, an extraordinarily accurate and astute knowledge of all his lakeside locales. The spelling of all place-names, with the exception of Ajicjic and Tuxcueco, is exactly as it is today. Details of clothing, habits and customs all ring true. Embree’s knowledge of the region’s nineteenth century history is equally impressive. As one small example, the story begins in the shadow of St. Michael’s hill in Chapala in May 1833, amidst fear of an epidemic of smallpox. In real life, the nearby city of Guadalajara suffered a cholera epidemic in the summer of 1833. From a human geography perspective, this novel offers us one of the earliest descriptions of everyday indigenous life in the region. As Dr. Wolfgang Vogt of the University of Guadalajara has pointed out, even by the 1920s (twenty years after Embree’s novel), virtually no-one was observing or writing about this area from an indigenous point of view. Embree’s novel has particular value since it examines the conflicts between Indians and Spaniards, anticipating the themes explored by D. H. Lawrence when he visited Chapala for a couple of months in 1923 and penned the first draft of The Plumed Serpent. 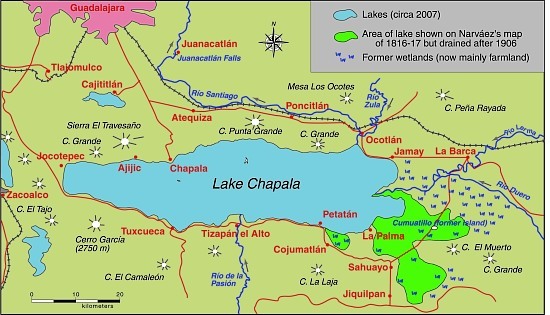 Lake Chapala, showing area drained at start of 20th century. Map: Tony Burton. All rights reserved. They were riding over a rough trail with cacti and stones about, and here and there a flock of goats. To the right was a seemingly endless chain of mountains, to the left, more distant, rose St. Michael, low and round (behind whose bulk lay Chapala and the water), and the larger head, called Angostura, lying between that town and Ajicjic on the lake’s edge. Between Angostura and the opposite mountain chain the road led, rising to a hill, to whose summit the little army came. They looked down on the lake and, nearer, small irregular fields, scores of them, checkering a level stretch from mountains to water. Out of these, Ajicjic’s church thrust up a single gleaming tower of white. Three o’clock found the troop sweeping into the barren plaza of that fishing village. To this day Ajicjic can claim no more than some two thousand souls. It has, even yet, no railroad, no stage; rarely has a vehicle been seen in that primitive place other than the awkward oxcart. Its low, unplastered adobe walls stand close together. The streets are alleys of extreme narrowness wherein there is mud when it rains, dust when it is dry, rocks and swine forever. Nigh every alley twists and turns, is for a block no more than a gutter, for another block a public stable for burros. Yet one may find some better quarters. The plaza, though it is only a bare, brown waste, is wide. The open court before the church, though it too is bare and dirty, with lonely, crumbling walls and pillars about it, yet has in its center a weather-beaten cross that speaks of service to the Lord. The troop filled the plaza. It was halted, and the inhabitants of the town, struck with amazement, either shut themselves up or gathered in silence round about. Groups of brown children, absolutely naked, sat down in the dirt, thumbs in mouth, to wonder in comfort. Rodrigo and Bonavidas began the inquiries, prefacing them with jocularly expressed friendship to certain storekeepers and a toss of tequila here and there down a willing throat. Boats? There hadn’t come but one boat to Ajicjic the blessed day. Ajicjic was losing importance in these times. On market days everybody went to the bigger market at Chapala, where the news was dispersed. And this one boat? It had come from Tizapan with a load of wood for the lime burners. The town of Tizapan lies at a short distance from the lake. The shore in that region is no such distinctly marked line of beach and rock as it is at Chapala. It is not even always easy to tell where the shore is. Between water and land there is a stretch of marsh for several hundred yards, watery, pierced by the spears of a million reeds that rise thick and green to a height of some feet. Here flock ducks in great numbers. The marsh is flat, bewildering, and dreary. Through its middle a stream, called the Tizapan River, cuts out more than one course, having formed a delta. The main course of this river, not over twenty yards at its widest part, usually much narrower, is navigable for canoas for half a mile to a point where the land is dry and from which the town lies yet another mile distant. The stream being crooked and the curves sharp, the progress from the open lake to the inner landing is usually made by poles. The lake approach to the town could be easily blocked by blocking the river. Only the one course is navigable. Nobody could cross the marshes. This fact was recognized more than a century ago. The town itself is like the greater part of Mexican towns, narrow and crooked streets with the low houses (joined together) shutting those streets in and making them seem even narrower, and the central plaza of considerable size left vacant. That plaza is today filled with flowers and fruit and contains a bandstand. In former times it was bare. The mountains rise only a little way behind the town, jagged and huge. Before them is a stretch of rolling green fields. The river, coming from the peaks, dashes down through this pastoral scene with a vivacity that has laid bare a rough and rocky bed whereon the water boils till it passes through the town. At the time when the two small armies were approaching Tizapan, much of the summer green was still on field and mountain. The unclouded sun poured his light over an emerald gem of the lake’s border. After their time in Mexico, the Embrees settled in Santa Ana, California. Embree published his second novel A Heart of Flame: the Story of a Master Passion in 1901, and supplied a steady stream of short stories to major magazines, including McClure’s, the San Francisco Argonaut and Sunset Magazine. Sadly, the couple had not long celebrated the birth of their only daughter Elinor in 1905 when Embree was taken seriously ill. He died on July 3, not yet 31 years old. It is tragic that someone who had produced work of this magnitude, should have died so terribly young. In his short time in Chapala, Charles Embree had acquired an excellent historical and geographical knowledge of the region at a time when American travelers to the lake were few and far between. Geo-Mexico believes that Charles Fleming Embree full deserves to be declared an Honorary Geographer. Note: The post is based on chapter 43 of Lake Chapala through the ages; an anthology of travellers’ tales (Sombrero Books, 2008) and on “American novelist Charles Fleming Embree set his first novel at Lake Chapala” (MexConnect, 2009). The downside to publicizing one of Mexico’s most beautiful beaches How was Playa Escondida (“Hidden Beach”) formed?